Vulcanization is the heating process which improve the welding cables durability and retains its elasticity. Welding cables are typically insulated with either PVC, Neoprene or EPDM, a type of synthetic elastomer with long chain polymers that can be vulcanized. Vulcanization is the heating process where polymers form a crosslink between individual polymer chains, producing a rubber that yields higher tensile strength and resistive properties. Vulcanization also makes rubber retain its shape and elasticity over a wider range of temperatures. Prior to the mid 1800s, when vulcanized rubber began to be industrialized, natural rubber had to be used instead. Before vulcanization, natural rubber would be mixed with acid in order for it to hardened so it can be shaped into the desired forms. Hardened rubber had various uses. However, it was not very practical, because when it is exposed to high temperatures, the rubber would become sticky or simply melt. In colder conditions, the rubber would become brittle and lose its elasticity. Since the discovery of vulcanization, rubber could be formed to a precise shape and dimensions and are able retains it forms over a wide range of temperatures, making it very practical for welding cables insulation. The vulcanization process was discovered by Charles Goodyear in 1839 and later patented in 1843. Goodyear was credited with discovering the vulcanization process. In his journal, he described the accidental process that occurred when he left sheets of rubber and sulfur by a stove. Upon returning to it the next morning, he found that the rubber had charred and had improved ruggedness. The chemical reactions between rubber and sulfur strengthened the rubber by forming cross links, or bridges, between the individual polymer chains rather than just dissolving in the rubber, resulting in a more improved molecule. Since vulcanization was first discovered by Charles Goodyear, experiments with different temperatures and chemicals have been used in order to achieve better results in the vulcanization process as well as rubber strength and resistance. The common practice of heating the rubber with sulfur alone was a very time consuming process. In order to make the process more practical for industrial production, accelerants were added to hasten the chemical reactions for cross linking sulfur and the individual chain polymers. Various chemicals, such as carbon black and zinc oxide, were added to improve the heat resistance and flexibility of the rubber. Chemicals like antioxidants were also used to improve the rubber resistance from deterioration caused by oxygen and ozone. Like natural rubber, synthetic rubber also use the similar vulcanization process to strengthen the rubber. Neoprene and EPDM, are the two common types of synthetic rubber used in welding cables that are vulcanized with sulfur. DuPont which is an American chemical company, invented Neoprene in 1930 and also later joined with Exxon and Uniroyal Chemical to produce EPDM. 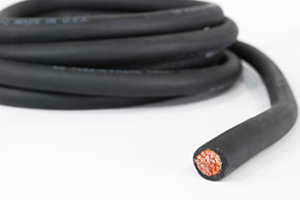 PVC is another synthetic rubber used in welding cables insulation. However, PVC does not utilize sulfur for the vulcanization process. Instead it uses peroxides for similar treatment. Neoprene which was the first synthetic rubber to be vulcanized with sulfur; have achieved much success in term of durability and flexibility. Neoprene has been widely used for welding cables, automotive fan belts, water hoses, wet suits, and many other applications. Neoprene is also known as polychloroprene, which consists of many smaller chained diene monomers called chloroprene, C4H5Cl, a compound made mostly from carbon and hydrogen atoms. During the vulcanization of Neoprene, atomic bridges formed between sulfur and polychloroprene, cross linking them to form a giant supermolecule.